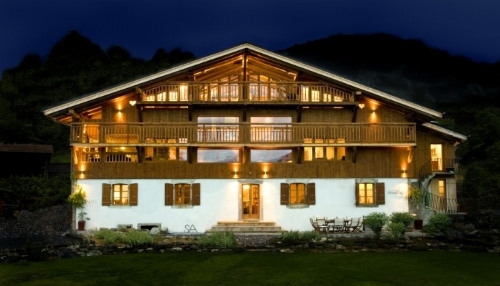 Snow or no snow, for family ski-ing or recharging parental batteries, this chalet is a spectacular mountain chalet in the breathtaking Grand Massif of the Haute Savoie Alps, available on an exclusive, fully catered basis or by the room as a boutique B&B. Samoëns a magnet for skiers and boarders but the incredible house itself and stunning Alpine scenery make Sky Chalet the ultimate antidote to the daily grind all year round. Plus, the nanny on request and easy 1 hour transfer time from Geneva Airport adds to the ease of a family break. 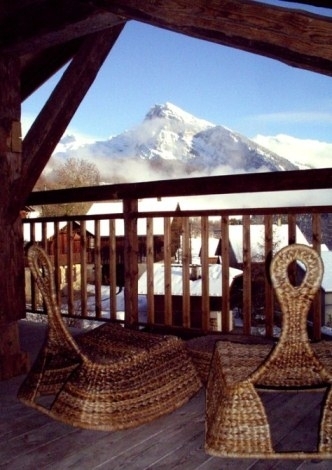 After a winter running a ski chalet in Chamonix, Andrew and Su (owners) scoured the French Alps to find the perfect setting to start a new life and fell in love with Sky Chalet. Leaving behind hectic lives in the UK, their mission was to create somewhere to where worries and stresses melt away while being pampered in the lap of luxury and the result is a fabulous retreat for frazzled parents, families and good friends! 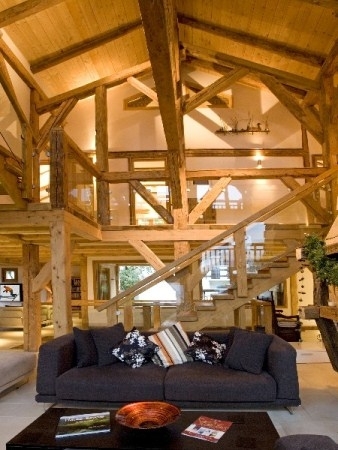 The couple have transformed the 350-year old Savoyard Barn with a savvy blend of traditional and modern styling. The exposed beams give it soul, whilst the sleek glass and stainless steel finishes give it contemporary gloss. The heart of the home is a stunning two-storey open plan living dining area, with floor to ceiling windows to gaze on the magnificent peaks and, although wonderfully spacious, the roaring fire and big squashy sofas ensure a comfy and cosy place to relax and enjoy time together. When youngsters need a distraction, there's a separate snug with state of the art home entertainment including a huge plasma TV, Sky, Xbox 3, Wi Fi and DVD library, plus each bedroom has Sky TV, DVD and CD players, an Ipod dock and Wi Fi. Spread over 3 floors, Sky Chalet has plenty of room for up to 18 guests, featuring 5 generously proportioned bedroom suites and a family suite. Each one is individually and tastefully styled, with an indulgent spa-style en-suite bathroom, complete with walk in rain shower, Molton Brown toiletries, fluffy towels and robes. 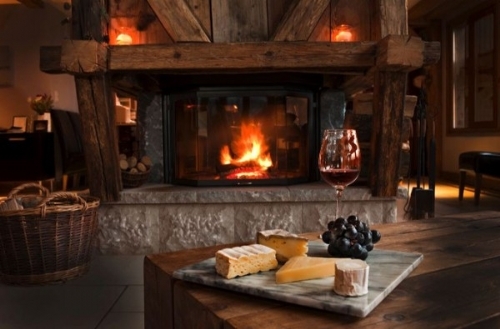 For après ski or simply après toddler (! ), the sauna, outdoor Jacuzzi and pool are just the thing. 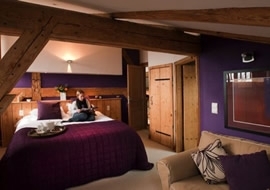 Plus a revitalising massage or reflexology treatment can be arranged in guest's rooms, plus a nanny can be arranged on request throughout the ski season to guarantee relaxation. 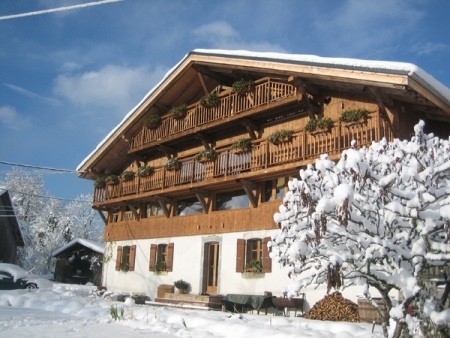 Outside, a wide enclosed balcony is a fabulous spot for admiring the views and the chalet also has a 150²m lawned garden, not forgetting the winter wonderland of snow fun and flower strewn spring meadows on the doorstep. Su and Andrew believe that no one should have to worry about the cooking, so the catering is exceptional. From hearty breakfasts and home baked cakes for afternoon tea, to Champagne and canapés followed by superb three course feasts and varied children's menus, it's well worth working up an appetite! Reservations made from this page will secure a double bedroom with king-sized bed and space for 1-2 cots and plus ensuite bathroom complete with walk-in rain shower and bath. Families with older children should consider the larger 'family room' with double sofa bed or the family suite which has a separate mezzanine sleeping area with 2 x kids beds and two bathrooms. Please Note: Prices are based on 2 adults & 1-2 infants under 2 years old. It includes, breakfast and afternoon tea for 7 days, pre dinner drinks, canapes and a 4-course evening meal with wine and coffee on 6 evenings (earlier 2 course childrens dinner provided) and in resort transfers. The winter sports are an obvious attraction, with over 265km of easily accessible pistes, a reliable record for snow and pleasantly milder temperatures. Private transfers are available to and from the Grand Massif Express gondola but with youngsters in tow, there's also endless fun to be had building snow men in the garden, going ice skating and taking a sleigh ride in the village, taking the chalet's snow sleds to the children's toboggan run and going on a dog sled or snow mobile adventure. For summer holidays, Sky Chalet has a whole new appeal, surrounding by the lush flower strewn Alpine meadows, with chalet balconies festooned in colourful blooms and piercing blue sky days regularly hitting temperatures into the 30's. The spectacular scenery makes the hiking second to none and a pack donkey can even be arranged to carry the picnic! There are waterslides at the local swimming pool, tours of the village on the SeptiTrain and nearby IndianaParc features high and low rope adventure courses for all ages. Day trips which are only an hour's drive from Sky Chalet include Annecy, known as The Venice of France, the medieval village of Yvoire on Lake Geneva and the bustling Alpine resort of Chamonix at the foot of Mont Blanc. Please note that the price is based 2 adults. Children under 2 stay free. For families with children over 2 please book the family suite option via the separate listing. 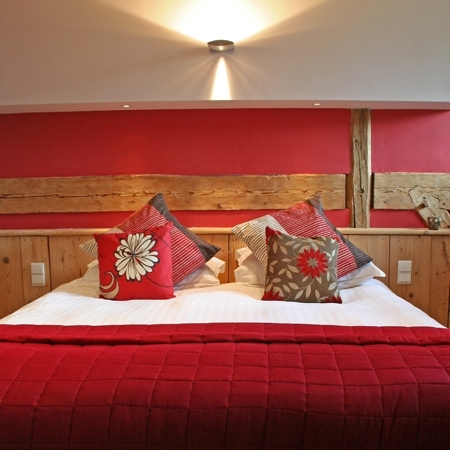 Sleeps 2-4 + cot in 1 double bedroom with ensuite & optional double sofa bed (at an extra charge to cover meals etc.). 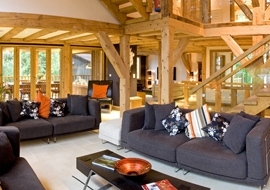 The Chalet has an outdoor, raised swimming pool and jacuzzi. 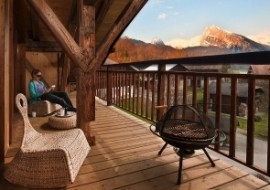 There is a sauna and jacuzzi at the Chalet whilst massages and beauty therapies can be arranged in-house. Baby gear provided includes; 2 travel cots with bedding, 2 highchairs, a baby bath, baby monitors, steriliser, potty, stairgates, socket covers, plastic crockery, cutlery and sippy cups. For indoor play there are bath toys, kids books, a basket of toys for all ages and a selection of kids DVDs. Outdoor toys include snow sleds suitable for both babies and children. Spa treatments can be booked. 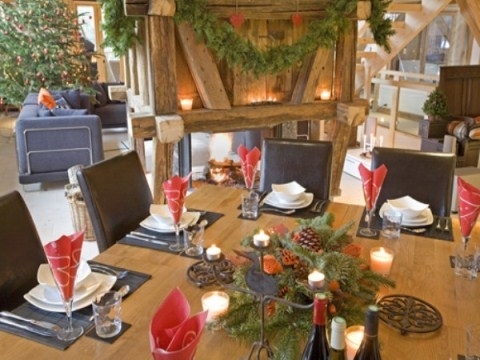 The chalet provides delcious food for guests in the form of a hearty breakfast, indulgent afternoon tea and canapes followed by a three course dinner and wine. Dinners are provided 6 nights a week. The house has a dining terrace, small lawn and several balconies. 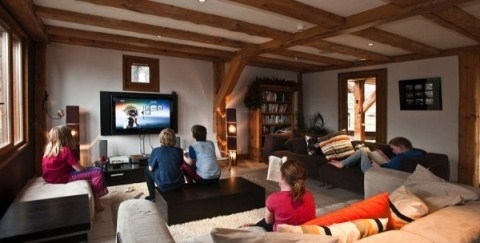 Wifi is provided throughout the chalet. 2 cots & highchairs are available.